Which Hong Kong celebrity once dined here and caused this humble eatery to shoot to fame? Plastered on the walls of 328 Katong Laksa are the pictures of Hong Kong stars Tony Leung Chiu-Wai and Ekin Cheng. 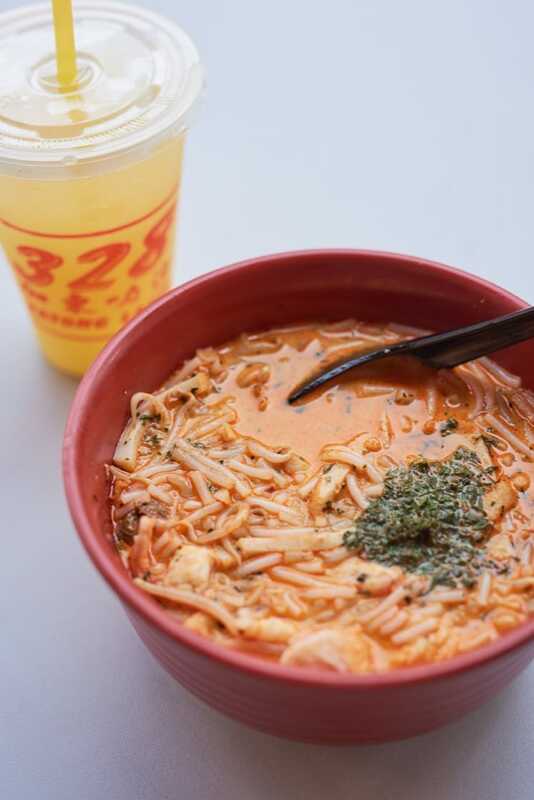 "Many people read about 328 Katong Laksa in the news, which reported Mr. Leung’s visit to us when he was in Singapore for an awards ceremony," says founder Lucy Lim. She is no stranger to fame herself. In 2013, Lim and her son Ryan Goh beat celebrity chef Gordon Ramsay in a Hawker Hero challenge to make the better bowl of laksa. Her flaming red hair is Lim’s iconic look. She believes it symbolises good fortune, just as she believes in the power of her restaurant’s name. Katong Laksa was named 328 as it sounds similar to 'prosperous business' in Cantonese. The stall at No. 49 closed down in 1998, and Lim took the opportunity to rent the space to sell laksa herself. The caveat — she had no experience in making laksa. So, Lim trawled the rest of the island to observe other stalls and sample their laksa. She came up with her own recipe after multiple rounds of tasting and asking questions. Due to problems with the lease, Lim had to move to No. 51. There, the business unexpectedly took a dive, forcing her to throw away most of her unsold laksa every night for years. Things became better only when she opened a branch at 216 East Coast Road. The defining characteristics of Katong Laksa are the thick rice vermicelli noodles and the coconut-rich laksa gravy. Combine these with plump shrimps, fish cakes and fresh clams (or cockles), enhanced with the aroma of curry leaves, and you get a bowl of internationally renowned Katong laksa. 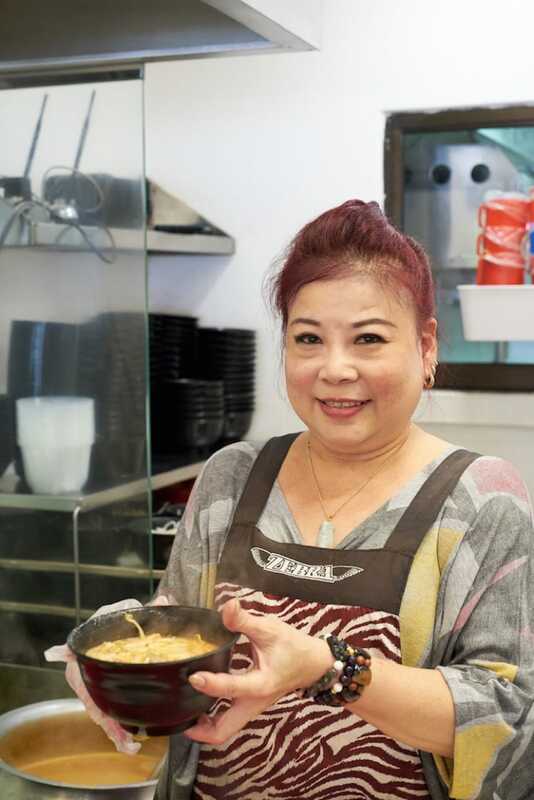 Lim believes that doing every step right is vital to making good laksa, down to the most basic procedures such as boiling the rice vermicelli. She has strict rules on the portions of ingredients used, especially when it comes to the gravy and dried shrimps. These rules are applied across all the outlets. The process of adding coconut milk into the soup is probably the most crucial: if the heat is not controlled properly and the coconut milk comes to a boil, the whole dish is ruined. "In the beginning I did everything myself: preparing the laksa, peeling the shrimp...", says Lim. "Nowadays we have factories making our laksa gravy and coconut milk, but that doesn’t mean I’m less vigilant on quality control. For example, the coconut milk must be extracted from mature coconuts. If I receive shrimp that are less than fresh, I send them back." The East Coast Road is where it all started; the street was once crowded with Katong Laksa stalls. Now only 328 Katong Laksa remains, although people still associate Katong Laksa with East Coast Road. View all Behind the Bib stories here. Get in line at this mutton soup stall which opens for just two and a half hours every day. Time-honoured recipes and a time-consuming cooking method are the secret behind each charcoal-kissed claypot of rice. The recipe to success is in perfecting the techniques for the simplest of steamed fish to the complex flavours of fish head curry.